All was delusion, nought was truth." 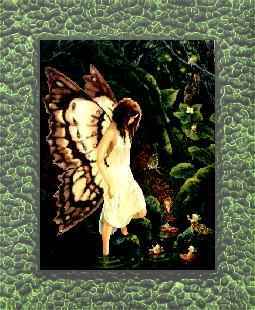 O' blessed little faerie child, stolen from the Great Forest of Fae, when but wee and helpless. Traded to the mortals by mischeivous pixies in exchange for a human babe. Enia Oak, fair 'n lovely little fae child, how did you ever find your way home? Twas it the sprouts of little fae wings that tortured your soul to fly? Twas it the hunger for the Great Forest of Fae from whence thou came? The Elfland sings praises to the day of thy return to your rightful place amongst the Fae. Your journey home has become a legend in the Enchanted Forest and the mystical Forest of Ailfen Wood Hollow. Enia Oak, you blessed this place with your kind visitation. Welcome home to Faeland! or sign my guestbook to let me know, so that I can be warmed!